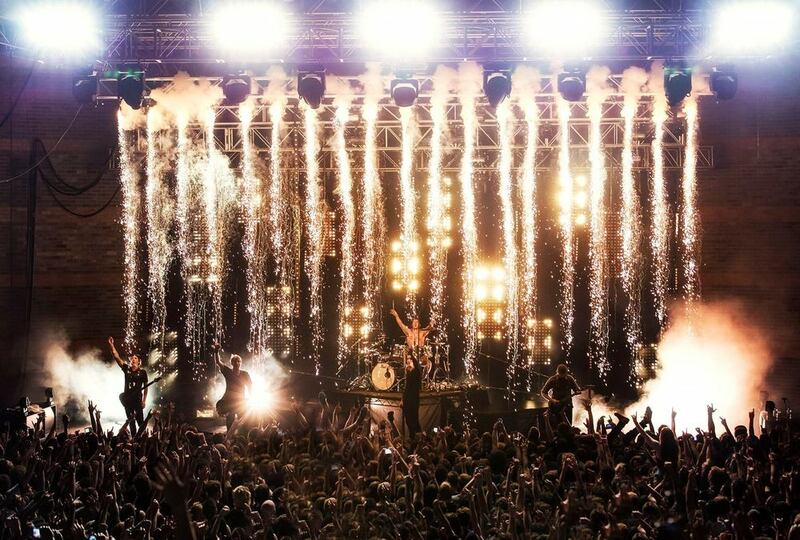 We were invited by Parkway Drive on their recent Australian 'IRE' Tour to provide turnkey production and provision of a range of pyrotechnics and special effects. The shows started with Parkway Drive appearing silhouetted behind a massive 'IRE' banner which on cue was dropped with our Kabuki Powerdrops with an unrivalled massive hit of white confetti from 4 Stadium Shot Cannons either side of stage to start the shows with a bang in a haze of flutter. Red and White Stadium Streamers were used for outdoor shows of the tour at Red Hill Auditorium Perth and Riverstage Brisbane for ease of cleanup and to keep our environmental impact to a minimum. Throughout the set there was a number of flame cues, shooting fireballs simultaneously and in chases to highlight certain parts or the music and set. Fire is so captivating because of the radiated heat, light and power it seems to draw the audience so much deeper into the performance. There were also 2 other Kabuki drops over 3 truss in the bands set which dropped to reveal lights and another dimension and element to the stage light-show. The band walked off stage after their last song filled with a number of flame shots leaving the audience hanging for an encore. Parkway Drive returned to the stage with our 10 metre 'Dragons Tail' Flame Bar creating a wall rail of fire setting the stage alight for their encore performance which created such an ominous yet mesmerizing unique flame effect. After the first encore, a single red pyrotechnic flare was prepped handed to frontman Winston securely fastened into a holder with one shot compact hand-held pyrotechnic firing system we had custom designed and built for the tour which features arm key switch, continuity test LED and Fire Button as well as being a tidy unit smaller than the size of a packet of smokes. With the stage dimmed, the flare was handheld and manually fired providing a vivid and bright low smoke almost simulated distress signal completely illuminating the entire stage and surroundings. During this last song, we also had a pyrotechnic waterfall hung from overhead truss in an inverted (upside down) configuration which on cue was fired producing a falling plume of sparks arranged in a line to create a pyrotechnic wall of falling stars simulating a waterfall with the sparks gently falling over the band to highlight the climatic end to the set. RIP IT UP: "Parkway thrive in such an energetic atmosphere, and combined with an all-new stage show, they’ve become even more of an experience—confetti cannons, flares, and pyrotechnics galore made the already-hot, thousands-full room even hotter"
THE MUSIC: "A shower of sparks rained upon the boys from Byron as the show reached its climax, closing with Home Is For The Heartless. Good bands deliver you an experience. Parkway Drive delivered us a lifetime memory; simply unforgettable."